As the St. Louis entrepreneurial community continues to gather national accolades, the St. Louis Mosaic Project announces its Immigrant Entrepreneurship Advisory Board with the visit of Administrator Maria Contreras-Sweet. This occurs at a roundtable discussion on May 1 at 10:00 am at the World Trade Center St. Louis. Betsy Cohen, Executive Director of the St. Louis Mosaic Project, emphasized the importance of Contreras-Sweet's visit as "a fantastic opportunity for local immigrant entrepreneurs in our community to share their experiences and depict the breadth of our entrepreneurial community spanning from high tech start ups to neighborhood businesses.?? Contreras-Sweet, a successful entrepreneur and business executive, was appointed to lead the SBA in April 2014. In her role as Administrator, she continues to build upon her career in both the public and private sector, championing causes in diversity, accessibility to capital, and equal opportunities for all. Prior to her appointment, Contreras-Sweet founded the first Latino-formed commercial bank in California in more than 35 years and served as Vice President and Equity Partner for Westinghouse's 7-Up / RC Bottling Company. According to Cohen, "this visit is another piece to the St. Louis Mosaic Project's commitment to supporting local immigrant entrepreneurs. Our Immigrant Entrepreneurship Program takes a holistic approach to helping entrepreneurs turn their ideas into a reality. By connecting immigrants to the range of support and programming found in the St. Louis Ecosystem, entrepreneurs are equipped with the resources to grow or start their own businesses. " The St. Louis Mosaic Project was launched in 2012 in response to an economic impact report, outlining St. Louis to be lagging in immigrant growth as well as highlighting the economic benefits of increasing its foreign-born population. 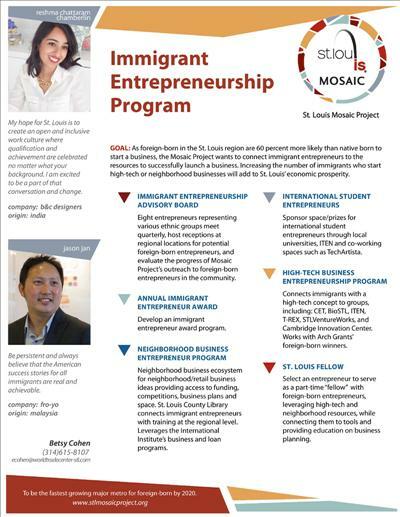 The Mosaic Project's goal is to transform St. Louis into the fastest growing metropolitan area for immigration by 2020 and promote regional prosperity through immigration and innovation. This regional initiative is professionally managed by the St. Louis Economic Development Partnership, World Trade Center St. Louis and a 22- Member Committee.